What Kamen Rider Are You? Thought I would post some quiz results and what not. This should be fun! Keep in mind, I don't know what the heck a kamen rider is... I think that makes it easier to take quizzes- when you can't guess who says what or predict your result. 1. If you've taken quizzes before, you probably know what the first question is when I say it is "typical." 2. Favorite animal is easily a dragon. ^_^ If unicorns were listed, it would be a difficult battle. 3. Why am I fighting? Didn't know I was... but prizes are good. 4. A fellow rider? Sounds like a friend, so why would I want to hurt them??? Then again, why am I imagining a fellow tribute in the hunger games right nowwww? It's time to play! 5. And it looks like these games are deadly. All these nuisances trying to kill me. Sheesh.And I just wanted to have fun! 6. Mirror Monster sounds promising...like something that can steal a friend's face? It is unforgiveable! 7. Student...or journalist? I'd better go with journalist, just because student is very generic. 8. So being a rider is not public knowledge? Who cares? No, really...what's the big deal with these rider people? 9. Yes...what was the point of fighting to the death 0_o? 10. Good quiz, and just as confusing as I'd hoped. Heeeeeey.... this doesn't look like an anime! XD what was I expecting? 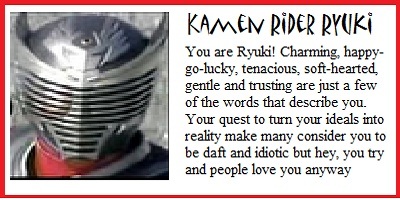 Okay, so I am.... Kamen Rider Ryuki.